After you prepare your garden beds and harden off the seedlings, it’s time to transplant your seedlings into the garden. Transplant seedlings on a calm, cloudy day, if possible. Late afternoon is a good time because plants can recover from the shock of transplanting without sitting in the midday heat and sun. Your garden soil should be moist, but not soggy. If the weather has been dry, water the planting area the day before you plant. Moisten the soil in your flats or pots so it holds together around the plants’ roots when you remove the plants from their containers. When setting out plants in biodegradable peat pots, make slits down the sides of the pots or gently tear the sides to enable the roots to push through. Make sure that no part of the peat pot appears above the soil; the exposed peat acts as a moisture wick and can dry out the soil quickly. Use a hoe, spade, or trowel to make a small hole in your garden for each seedling. The hole should be deep enough so the transplant is at the same depth in the ground as it was in the pot (except for tomatoes). Make the hole twice as wide as the root ball. Unpot a seedling (unless it’s in a peat pot) by turning its pot upside down and cupping the seedling with your hand. Be sure to keep the root mass and soil intact. If the seedling doesn’t come out easily, gently tap on the edge of the pot or gently press on the bottom of each cell of the flat with your fingers. Whatever you do, don’t yank out a plant by its stem. Check the root ball’s condition. If the roots are wound around the outside of the pot, work them loose with your fingers so they can grow out into the soil. Unwind larger roots and break smaller ones (this won’t hurt them) so they all point outward. Try to keep as much of the original soil intact as possible. Mix a diluted liquid fertilizer into the soil of the planting hole to help the plants get off to a fast start. Reduce the recommended strength on the fertilizer container by half. For example, if it says apply 1 tablespoon per gallon of water, use only 1/2 tablespoon. Put each prepared seedling into the holes that you made. 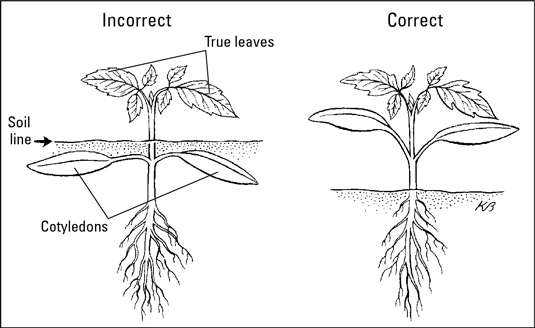 Plant seedlings at the correct depth. Tomatoes prefer deeper planting. Remove all but the top 3 or 4 sets of leaves, before planting. Tomatoes grow extra roots along the lower portion of their stems and thrive with this treatment. After firming the soil around the roots with your hands, form a shallow soil basin around the base of the transplant. The soil basin serves as a moat around the seedling to hold water. When you water or when it rains, the moisture stays in the moat and drains to where the roots are located. Depending on the conditions, water the bed that day or the next. If the weather has been dry or if the soil is sandy, you may want to water the entire bed; if it’s rainy or the soil is already very wet, wait until tomorrow to water. Keep the bed moist while the seedlings get established and begin to grow strongly. Mulch after the seedlings become well-established. In extreme hot, dry weather, provide temporary shade for transplants with paper tents or wooden shingles pushed into the ground on the south or west side of the plants. If you don’t get an ideal transplanting day and the weather is hot and sunny, shade the plants until the sun goes down. And don’t be alarmed if your plants look a little droopy after you set them out; they’ll soon recover. Cabbage seedlings can droop and look almost dead, for example, and be up and growing in a day or two.